Join Miz Lillie, her friends Maxwell and Minnie, and Oscar the marmalade cat, through a year of friendship and gardening, from planning the plantings through sharing the harvest. Follow Miz Lillie and her friends through the seasons as they pitch in together to grow a bountiful garden for all to share. When Miz Lillie dreams of her Grandma June she discovers the secret to helping plants grow to be strong and tasty. Help Miz Lillie's garden grow by singing along! Lorna Miller hails from Portland, Oregon and has been surrounded by music all of her life. When not tending to her garden, she hosts Little Kids Jamboree, an interactive family event which honors and shares the richness of song. 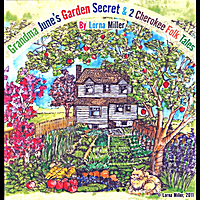 The audio storybook of "Grandma June's Garden Secret & 2 Cherokee Folktales" features the voices of Lorna Miller, her children Lisa and Ian Miller, and Sam A. Mowry, with music by Lorna and Ian Miller.